Rhymes for Elementary level kids to make their learning joyful Teachers have to plan for the perfect teaching learning Process to deal with the kids who are new to the school world. Teachers have to adopt Play way method to attract the children towards school as well as learning world by Rhymes and Games. 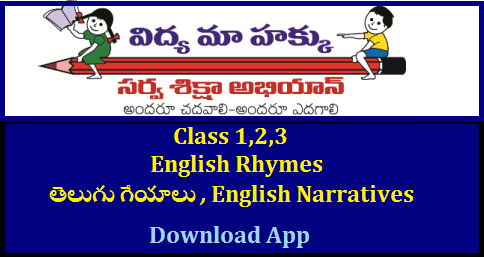 Sarva Shiksha Abhiyan prepared Android Apps for Telugu and English Audio Rhymes which helpful to teachers at school level in their way of teaching. Myself checked the App really they are very useful. Today First class children learned Rhyme "Monkeys are Jumping Just Like This". Chidren Enjoyed a lot with Actions.